Every team trains, every team lifts, every team conditions. It’s not that you do those things. It’s at what Standards you do those things. The concept of establishing and embracing high standards obviously resonated with lots of coaches because it was my most retweeted post over the past four years. 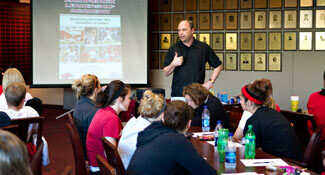 Without a doubt, your team’s Standards define and differentiate your program. If you can establish high standards early on, get your staff and athletes to fully embrace them, and ultimately hold each other accountable and enforce them with each other, you will create a Championship Culture that will allow you to consistently win on and off the field and court. 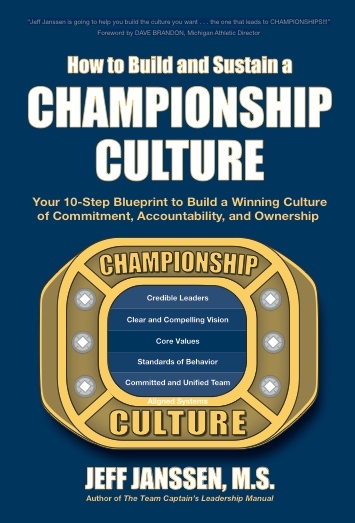 In looking at the success secrets of the over 30 NCAA National Championship we have worked with in writing our How to Build and Sustain a Championship Culture book, we’ve discovered five important ways that championship teams set the standard in their programs - and many times set the standard in their sport as well. As you read through each of them, I encourage you to turn the microscope on your program to see how well your team employs each of the concepts. These high Standards apply to several areas including practices, weights, conditioning, nutrition, sleep, social life, and typically extend beyond the playing field when it comes to academics and giving back to the community. As I mentioned at the onset, every team trains, every team lifts, every team conditions. It’s not that you do those things. It’s at what Standards you do those things. Does your team do them with full focus and effort and push through their comfort zone to get better? Or does your team simply train, lift, and condition at an Existent or Compliant level - and skip workouts if no one is watching or holds them accountable? What other programs might be able to get away with on a regular basis, Championship Programs would never even think of doing. Further, the high Standards of Behavior aren’t just applied once and forgotten. The standard is an every day expectation and obligation that people will bring their best effort. This constant and sustained commitment to excellence then is a key factor in Championship Cultures getting the most out of their potential. Further, when everyone demands the best from each other, you create such a high-level, focused, and intense environment in your workouts that everyone can’t help but get better. For Championship Cultures, practices are often more intense than games because everyone competes at such a high standard. Disney is a great example of a company culture that is all about having high Standards of Behavior. When you go to any Disney venue, be it the Magic Kingdom, Epcot, Animal Kingdom, Downtown Disney, or a Disney Cruise, you will notice a tremendous attention to detail. Their places are squeaky clean because of their high standards. Disney trains and employs people whose sole job is to pick up trash on the ground almost as soon as it is dropped. Disney’s high standards are what differentiates them from many of their competitors and makes them one of the world’s most respected companies. How do your Standards of Behavior differentiate your program? Pittsburgh Steelers coach Mike Tomlin has a succinct but powerful phrase that he repeatedly uses - “The Standard is the Standard.” This great phrase has a variety of important meanings when it comes to Standards of Behavior. Coach Tomlin will not compromise the Steelers’ Standards in terms of the winning tradition they have developed. He is not going to compromise the Standard when a sub has to replace a starter. He is not going to compromise the Standard when selecting or trading for players who fit the Steelers’ culture. He is not going to compromise the Standard if the Steelers are up or down by 35 points with two minutes left in the game. The Standard is indeed the Standard. If you want to build and sustain a Championship Culture, you too must implement and stay true to the philosophy that “The Standard is the Standard.” That’s why you don’t get 6 points for advancing the football all the way to the 5-yard line. You only get 6 points when you cross the goal line. That’s why you do the drill over again if you don’t make the pre-determined number. That’s why you keep conditioning if you don’t make the specified time. That’s why you get a B for a grade if you don’t make the cutoff for an A. The Standard is the Standard. Championship Cultures set their Standards high and are uncompromising when it comes to meeting them. In the Special Forces units, Standards in both training and execution must be uncompromisingly high because lives are on the line. If a person doesn’t meet a necessary standard, they could jeopardize their own life and lives of their colleagues. Thus, Standards are set and strictly demanded at a high level because they are so important to success of the mission and the preservation of the unit. Standards of Behavior not only apply on the playing fields but off the field as well. For example, former Tennessee women’s basketball coach Pat Summitt’s Standard for her team was to sit in the first three rows of the class. Her program set this Standard because they valued education and wanted to lead not only on the court but in the classroom as well. While some athletes skip class or sit in the back row when they do go, Summitt’s players were front and center and ready to learn and contribute. It’s no wonder that in over 30 years of coaching, every one of Summitt’s players graduated who completed her program. "If we're on campus, you're going to class. You can sit, preferably in the first row, but in the first three rows. And you've got to sit up straight and you've got to pay attention. The professor needs to know your name."